In this book one of the world's foremost legal historians attempts to explain what produced the private law of the western world as we know it today. Professor van Caenegem pays particular attention to the origins of the common law - civil law dichotomy, and how it arose that England and the continent of Europe, although sharing the same civilisation and values, live under two different legal systems. The chronological coverage extends from the Germanic invasion in the early Middle Ages to the present day, incorporating analysis of the medieval Roman and canon law (both products of the law schools), and that of the School of Natural Law which inspired the great national codifications of the modern age. Professor van Caenegem evaluates the role of the lawgivers - emperors, kings and parliaments - and that of the judges, particularly, of course, in the lands of the English common law. He deals with the great phases of legal development and the main bodies of doctrine and legislation (rather than offer an analysis of the legal norms themselves); with substantive private law - family and status, property, contract, inheritance, trade - and with the organisation of the courts and the forms of process. 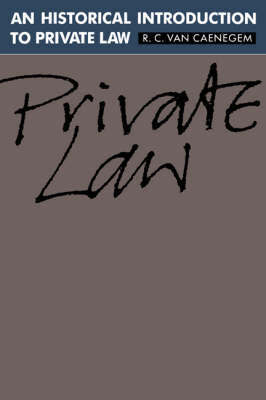 An Historical Introduction to Private Law is based on both an extensive secondary literature in several languages, and on evidence accumulated by Professor van Caenegem over the past forty years.